animals are moving, or won’t be in the frame long, and produce high quality up close pictures. High quantities of this camera system are deployed year round to scout locations for more expensive and higher quality systems, or in areas where where the camera needs to operate for over a year in incredibly harsh conditions. correct the slower shutter time of this camera and yield high quality photo’s. 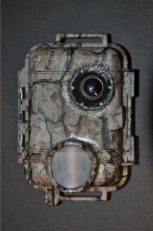 These video camera setups capture HD video of wildlife in the highest quality. They use white LED’s for filming at night as opposed to an IR array for a more natural feel to the video.